For other uses, see Altay (disambiguation). The Altai Mountains (/ɑːlˈtaɪ/), also spelled Altay Mountains, are a mountain range in Central and East Asia, where Russia, China, Mongolia, and Kazakhstan come together, and are where the rivers Irtysh and Ob have their headwaters. The massif merges with the Sayan Mountains in the northwest, and gradually becomes lower in the southeast, where it and merges into the high plateau of the Gobi Desert. It spans from about 45° to 52° N and from about 84° to 99° E.
The region is inhabited by a sparse but ethnically diverse population, including Russians, Kazakhs, Altais, and Mongolians. The local economy is based on bovine, sheep, and horse husbandry, agriculture, forestry, and mining. The now-disputed Altaic language family takes its name from this mountain range. 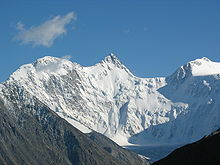 The mountains are called Altain nuruu (Алтайн нуруу) in Khalkha Mongolian, altai-yin niruɣu in Chakhar Mongolian, and Altay tuular (Алтай туулар) in the Altay language. They are also called Altaı taýlary (Алтай таулары or التاي تاۋلارى‎) in Kazakh; Altajskije gory (Алтайские горы) in Russian; Altay Taghliri (ئالتاي تاغلىرى or Алтай Тағлири) in Uyghur; ā'ěrtài shānmài in Chinese (阿尔泰山脉 simplified, 阿爾泰山脈 traditional, or اَعَرتَىْ شًامَىْ‎ in Xiao'erjing); and Arteː shanmeː (Артэ Шанмэ) in Dungan. The name comes from the word alt that means "gold" in Mongolic languages and the -tai suffix that means "with"; thus, literally, the "Mountains with Gold". That matches their old Chinese name 金山, literally "Gold Mountain". Also, the word for "gold" is altın in Turkic languages. Shavlo Lake in Northern Chuysky Range. The Altai mountains are home to a diverse fauna, because of its different habitats, like steppes, northern taigas and alpine vegetation. Steep slopes are home to the Siberian ibex (Capra sibirica), whereas the rare argali (Ovis ammon) is found on more gentle slopes. Deer are represented by five species: Altai wapiti (Cervus elaphus sibiricus), moose (Alces alces), forest reindeer (Rangifer tarandus valentinae), Siberian musk deer (Moschus moschiferus), and Siberian roe deer (Capreolus pygargus). Moose and reindeer however, are restricted to the northern parts of the mountain range. The wild boar (Sus scrofa) is found in the lower foothills and surrounding lowlands. Until recently, the Mongolian gazelle (Procapra gutturosa) was found in the Russian Altai mountains, more specifically in the Chuya River steppe close to the Mongolian border. Large predators are represented by snow leopards (Panthera uncia, syn. Uncia uncia), wolves (Canis lupus), lynx (Lynx lynx), and brown bears (Ursus arctos), in the northern parts also by the wolverine (Gulo gulo). The Tien Shan dhole (Cuon alpinus hesperius) (a northwestern subspecies of the Asiatic wild dog) also lives there. The Altain mountains have retained a remarkably stable climate changing little since the last ice age. In addition the mix of mammals has remained largely the same, with a few exceptions such as extinct Mammoths, making it one of the few places on earth to retain an ice age fauna. The Altai mountains were home to the Denisovan branch of hominids who were contemporaries of Neanderthals and of Homo Sapiens (modern humans), descended from Hominids who reached Asia earlier than modern humans. The Denisova hominin, dated to 40,000 years ago, was discovered in the Denisova Cave of the Altai mountains in southern Siberia in 2008. Knowledge of the Denisovan humans derives primarily from DNA evidence and artifacts, as no complete skeletons have yet been recovered. DNA evidence has been unusually well preserved because of the low average temperature in the Denisova caves. Neanderthal bones and tools made by Homo sapienshave also been found in the Denisova Cave, making it the only place in the world where all three hominids are known to have lived. ^ a b c d e f g h i j k Kropotkin 1911, p. 758. ^ "Altai Republic :: official portal". Eng.altai-republic.ru. June 30, 1999. Archived from the original on March 16, 2012. Retrieved August 13, 2012. ^ Klotz, Gerhard; et al. (1989). Hochgebirge der Erde und ihre Pflanzen und Tierwelt (in German). Leipzig: Urania Verlag. ISBN 3-332-00209-0. ^ Mazak, Vratislav (2004). "Der Tiger". Nachdruck der 3. Auflage von 1983. Hohenwarsleben: Westarp Wissenschaften. ISBN 3-89432-759-6. ^ Nowell, K.; Jackson, P. (1996). Wild cats: Status survey and conservation action plan. IUCN/SSC Cat Specialist Group, Gland, Switzerland. Retrieved 17 March 2016. ^ Sipko, Taras P. (2009). "European bison in Russia – past, present and future". European Bison Conservation Newsletter. Band 2: 148–159. ^ a b c d Colin Barras (January 23, 2014). "Ice-age animals live on in Eurasian mountain range". New Scientist. Retrieved March 4, 2014. ^ Pritchard, Hamish (August 3, 2011). "Ancient dog skull unearthed in Siberia". BBC News. Retrieved August 4, 2011. ^ Ovodov, Nikolai D.; Crockford, Susan J.; Kuzmin, Yaroslav V.; Higham, Thomas F. G.; Hodgins, Gregory W. L.; Plicht, Johannes van der (July 28, 2011). "A 33,000-Year-Old Incipient Dog from the Altai Mountains of Siberia: Evidence of the Earliest Domestication Disrupted by the Last Glacial Maximum". PLoS ONE. Retrieved August 4, 2011. ^ Druzhkova, Anna S.; Thalmann, Olaf; Trifonov, Vladimir A. (March 6, 2013). "Ancient DNA Analysis Affirms the Canid from Altai as a Primitive Dog". PLOS ONE. ^ Keys, David (January 2009). "Scholars crack the code of an ancient enigma". BBC History Magazine. 10 (1): 9. 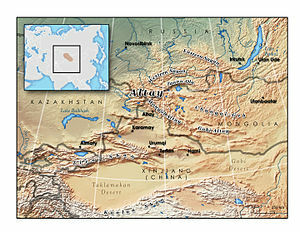 ^ "Greater Altai – Altai Krai, Republic of Altai, Tyva (Tuva), and Novosibirsk – Crossroads". Archived from the original on March 14, 2007. Retrieved 30 November 2006.